The Affordable Care Act still figures to be a prevalent issue when voters go to the polls later this year, and lingering support for the law stands to boost Republicans. About eight in 10 voters say a candidate's stance on the law, known as Obamacare, will be important when they vote this November, according to a new Pew Research-USA Today poll released Thursday. That includes more than half — 54 percent — who say it will be "very important." The group rating Obamacare as "very important" is made up of many enthusiastic Republicans as well as Independent voters. By nearly a 2-1 margin, those who say the law will be "very important" in determining their vote disapprove of Obamacare. Republicans and people who oppose the law are more enthusiastic at this stage, a possibly crucial factor in a midterm election, which depends heavily on turnout. President Barack Obama said last week that more than 7 million Americans had signed up for insurance through the exchanges created by the Affordable Care Act. The Pew-USA Today survey was taken in the aftermath of that announcement. Americans still disapprove of the law by a 50-37 split, which has not moved since last month. Independent voters disapprove by a 20-point margin, and 45 percent of Independents say their views of the law will be "very important" in determining their vote. 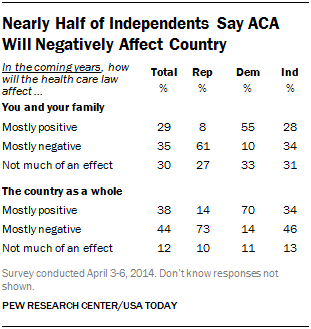 Most Independent voters think the Affordable Care Act has had, and will continue to have, a negative effect on the country. A recent Rasmussen Report shows unfavorable opinions of the law at their highest level, matching the all-time high of last November. Additionally, 53 percent—the highest level in three years--believe the quality of care will be worse. Overall, Americans expect a slightly brighter future for the law, but a plurality still think it will have a negative effect on the country in the coming years. The key battle in this year's midterm election will come in the Senate, where Democrats are trying to prevent a Republican takeover that would massively hinder Obama's ambitions as president over his final two years. Republicans need to swing six seats to take back control of the Senate.